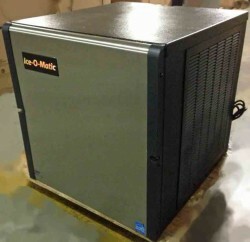 The IceOMatic model ICE0520A icemaker is 22” wide and has ice production of 520 pounds. It is air-cooled and requires and bin, hotel dispenser or soda dispenser to store the produced ice. The ICE-0520 is perfect for narrow spaces due to its narrow profile and high output. It is perfect for use in the food and hospitality industry, where high volumes of ice are needed on a daily basis. This unit can be paired with a variety of storage bins and beverage dispensers. The width of this model is only 22”, which allows it to be easily installed in narrow and tight spaces. Owing to its superior construction, Ice-O-Matic icemakers are fabricated from long-lasting stainless steel on the interior and an amalgamation of high quality fingerprint proof moulding and stainless steel on the exterior. The Ice-O-Matic merges the core, which is made of copper to increase conductivity, and nickel plated evaporator that counters the destructive force of water and ice over a prolonged period of time. Electroless nickel plating is used for coating appliances with a layer of nickel phosphorous to reduce wear, and is needed when hardness and corrosion protection is required. Owing to this added layer of protection, the Ice-O-Matic model ICE0520A ice machine is long lasting. As such, you can be confident in purchasing a used or refurbished model, which will save you money while giving you confidence in your purchase.